There aren’t many yetis in the Valley of the Yetis. A more accurate title would be the Valley of the Men and Occasionally Some Yetis. 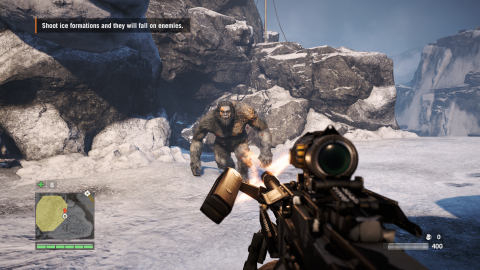 The mythical Himalayan monsters are strangely underused in this chunk of downloadable story for Far Cry 4. You spend more time fighting angry cultists who worship them than the beasts themselves. Perhaps this is intentional, to give the moments where you do see them more weight. But I came out feeling like I hadn’t seen as many yetis as I expected. The new map is excellent. It’s about a quarter of the size of Kyrat, and a dramatic change of scenery. Gone are the muted, autumnal forests, replaced by the kind of setting I first imagined when I heard Far Cry 4 would be set in the Himalayas. It’s a frozen landscape of jagged mountains, frozen lakes, and powdery snow, and it’s gorgeous. It’s more barren than Kyrat, with less of a human presence, but there’s still plenty of life in the form of wolves, snow leopards, yaks, and the odd yeti. The DLC opens with Ajay recovering from a helicopter crash. He stumbles away from the wreckage and comes across a radio relay station. He calls for help, but bad weather means his rescuers won’t arrive for a few days. And as if that wasn’t bad enough, an insane yeti-worshipping cult has decided he’s a trespasser and wants him dead. This DLC is a standalone story that doesn’t tie into the events of the main game in any meaningful way, which is fine. Think of it as a separate mini-campaign. There are story missions, and they’re pretty standard Far Cry fare. There’s nothing here you won’t have already seen if you liberated Kyrat. You’ll be staging ambushes, stealthing your way through enemy-controlled areas, and driving from point to point in jeeps and ski-doos. It’s a decent collection of missions, if slightly unimaginative. The cultists are based around the same enemy archetypes as Pagan Min’s army: the one that throws Molotovs, the heavy one, the one with the bow and arrow, and so on. After thirty hours in Far Cry 4 I’ve developed pretty foolproof ways of dealing with these guys, and I found the story missions a bit too easy as a result. The yetis are a different story, though. They’re huge, powerful, and disarmingly fast. You have to absolutely pummel them with bullets until they keel over, then you finish them off by moving behind them and hitting the F key to trigger a QTE. When they charge at you, you have to get the hell away, otherwise they’ll take off a sizeable amount of health and knock you on your arse, leaving you helpless. They’re enjoyable to fight, if only because they offer a different challenge to anything else in the game. Between story missions you have to defend the station from waves of cultists. To help, you can spend money you’ve collected from chests on defences like gun emplacements, explosive barrel traps, and mine fields. It’s basically a horde mode, but it’s pretty fun. I love watching clueless enemies stumble into my traps. These defence missions get steadily more difficult until, inevitably, you have to fight off yetis as well as cultists. One takes place during a lightning storm, which is pretty exciting. When you start Valley of the Yetis, your abilities and upgrades are all reset. But don’t worry, ‘cause chests filled with animal skins and generous helpings of XP mean you’ll be back to full power in a few hours. It compresses and streamlines the character progression of the main game pretty efficiently, so you don’t feel underpowered for too long. But, again, familiarity is an issue. There aren’t any new abilities, which means no surprises as you advance through the elephant/tiger skill trees again. There are some standout moments in Valley of the Yetis, like your first encounter with the creatures, which channels the tense stealth-horror of Alien: Isolation. The new setting is an exhilarating wingsuit playground of snowy peaks and icy valleys, and the breakneck defence missions force you to make clever use of all the game’s many weapons and tactics. And the yetis are cool, when they decide to show up. But, really, it’s just more Far Cry 4. That’s totally fine, but I was expecting something a bit more ambitious. And more yetis.